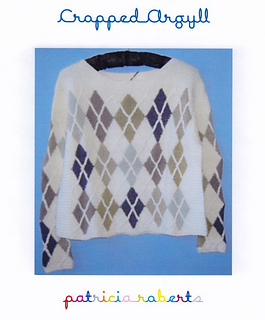 The Cropped Argyll sweater is a variation on an earlier design called Valentine. The classic Argyll design is given a fresh take with textured diamonds and travelling cable crosses. The sweater has striped side gussets. Tension/gauge is 19 sts to 5cm (2 inches) in width over the pattern and 56 rows 1 repeat of the pattern to 12.5cm (5 inches). 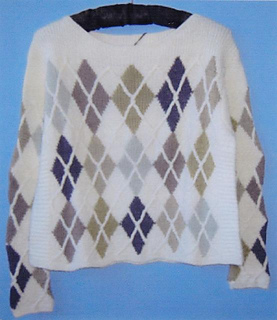 The sweater may be knitted in either Fine Cotton or Lambswool No 1. For Fine Cotton: 6 x 50g balls in mc, plus 2 x 5g balls in each of the 5 contrast colours. For Lambswool No 1: 5 x 50g balls in mc, plus either 1 ball of the same yarn or 2 x 25g balls of Patricia Roberts Angora in each of the 5 contrast colours.